Mr Prem Kumar Dhumal, Chief Minister, has underlined the need to redefine goals to meet the challenges of globalisation and liberalisation and to make the hill state self-reliant. In a message to the people on the eve of the statehood day, he said although the state had achieved much on the development front, which was a matter of pride for the people, yet a lot more was needed to be done. Stressing the need for the creation of the Himalayan Regional Development Council, the Chief Minister, Mr Prem Kumar Dhumal, today said keeping in view the peculiar climatic and topographical conditions of hill states, there was an urgent need to have a separate framework of policies for undertaking development in these regions. The Union Ministry of Power’s Policy on Hydro Power Development envisages benefits to investors by appropriately adjusting the normative level for incentives, simplication of procedures and further reassurances regarding return on investments. 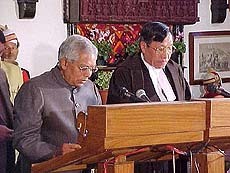 Mr Justice Wungazan Awangshi Shishak was sworn the Chief Justice of the Himachal Pradesh High Court here today by Himachal Governor Dr Suraj Bhan. The Chief Minister, Mr P.K. Dhumal, Leader of the Opposition, Virbhadra Singh, judges of the high court, Chief Secretary, Harsh Gupta and senior functionaries were present on the occasion. The Himachal Pradesh Housing Board has in principle decided to convert the leasehold residential properties in New Shimla and Kasumpti into freehold. The decision was taken at the meeting of the board held here today under the chairmanship of Mr Roop Das Kashyap, Urban Development Minister. The state has failed to make satisfactory progress on the agriculture front. In the past three decades an annual increase of 2.5 per cent in the production of crops has been witnessed as against a similar annual rate of growth in population. Mr Prem Kumar Dhumal, Chief Minister, has underlined the need to redefine goals to meet the challenges of globalisation and liberalisation and to make the hill state self-reliant. In a message to the people on the eve of the statehood day, he said although the state had achieved much on the development front, which was a matter of pride for the people, yet a lot more was needed to be done. He said the people of Himachal Pradesh today enjoyed, markedly better standard of living. The literacy percentage of the state had crossed 77 per cent which was much higher than the national average and the per capita income had also gone up to Rs 15,012, better than many other states. The state had over 14,000 educational institutions, 22,553 km. of road length and 2,685 health institutions. Besides, all census villages were electrified and provided with piped drinking water. He said Himachal Pradesh was today considered a pioneer in hill development. The past 46 months of the present state government had been a period of major initiatives and spectacular achievements for the state. The endeavour of the government had been to accelerate the pace of development by ensuring uniform and equal development of all areas of the state. It had also ensured flow of the benefits of development to the people who needed and deserved these the most. The success of the efforts of the government towards generating the feeling of oneness among people of all areas of the state had been recognised all over, he said, adding that the days of regionalism, casteism and parochialism were over. Mr Dhumal said the government had effectively handled formidable task of pulling the economy back on the rails with the support of the Prime Minister, Mr Atal Behari Vajpayee, who provided liberal central assistance amounting to hundreds of crores during the past over three years to meet the developmental needs of the state. The major thrust had been on exploitation of hydel power potential. For resource generation, the government had given added priority for a prospective plan to harness 10,000 MW of additional power by the end of the decade which would ensure an annual income of about Rs 1,800 crore to the state exchequer. He said the government had made headway in this direction by starting work on hydel projects having a generation capacity of over 7,100 MW during the past three-and-a-half years. These projects included the 2051 MW Parbati, 800 MW Kol Dam, 300 MW Chamera Stage-II, 176 MW Kashang, 100 MW Uhl-III, 12 MW Khauli, and 8 MW Ghanvi-II projects. The 86 MW Maana hydel project, executed in the private sector, went into production in less than three years time and the 22.5 MW Ghanvi, 3 MW Gumma and 2 MW Sal stage-II hydel projects had been commissioned by expediting the work on these. The projects which were likely to begin production during the next three years were the 126 MW Larji Hydel Project being executed by the state electricity board, the 300 MW Chamera Stage-II and 2 units of 250 MW each of 1500 MW Nathpa Jhakri Hydel Project being executed by the NJPC. As many as 2,732 industrial units had come up in the state during the past 46 months with an investment of Rs 423 crore and had provided employment to about 18,000 persons. Besides, 35 medium and large-scale industries involving an investment of Rs 300 crore and an employment potential of 3000 persons were in the pipeline. Information technology had been given top priority along with biotechnology. Himachal Pradesh was one of the few states in the country to have set up a software technology park at a cost of Rs 7 crore in Shimla last year. Another such park was proposed to be set up in the Baddi-Barotiwala area. An institute of information technology of international standard, which had an academic tie-up with the university of California at Barkley, was being set up at Vaknaghat where postgraduate and graduate classes were likely to begin from this year. Addressing a press conference here, he said there was a common feeling among various hill states that there should be a separate Himalayan council, to look into the needs and requirements of these regions. “The geographical and social conditions of hill people are often different from those in other states and at times the policies and programmes framed by the Central Government are not in conformity with our needs,” he opined. He informed that very soon a meeting of the Chief Ministers of hill states would be convened to discuss the various aspects. The Chief Minister said to strengthen the state economy, diversification in the agricultural and horticulture sector was the need of the hour. He said 60,000 apple root stocks had been imported so as to provide growers with the high yielding variety. “As compared to a yield of over 50 metric tonnes per hectare in European nations, Himachal’s yield barely touches 12 metric tonnes per hectare,” he said. He added that two wineries were being set up at Pragtinagar in Shimla and at Nagwain in Mandi to prepare export quality wine, using the culled apple. Mr Dhumal informed that the Rs 60-crore Information Technology Institute being set up at Vaknaghat in Solan would provide International standard IT education to the youth of Himachal. He added that a Rs 7-crore Software Technology Park had been set up at Shimla and another one was coming up at Baddi by a private unit. Mr Dhumal said his government had succeeded in bridging the gap between upper and lower Himachal, which had widened during the Congress regime. He disclosed that out of the total 133 Irrigation schemes in the state, 42 were being executed in Kangra district. He said work on the Rs 143-crore Shah Nehar project and Rs 33 crore Siddhatha scheme had been started. In reply to a question about carving out new districts from Kangra, Mr Dhumal said though they were administratively viable, the availability of funds was the main criteria. He assured that the state government would provide reservation to the OBC’s as per the recommendation of the commission, which was still in the process of identifying various communities. Before leaving for Shimla, the Chief Minister held a meeting with the district officials to review the progress of the ongoing development works in Kangra district. He exhorted officials to work with devotion and honesty for the benefit of the public. He said since Dharamsala was an international tourist destination, efforts should be made to maintain the roads and other basic tourism-related needs for which there was need for coordination between the various departments. Mr Dhumal directed the Deputy Commissioner to convene a meeting with forest and PWD officials to chalk out a concrete plan for the construction of a bypass for Dharamsala, so that work could begin to solve the traffic problem. Mr Dhumal will return here on January 28 for the second leg of winter sojourn. In an official note issued here today, Mr Yogendra Prasad, Chairman and Managing Director (CMD) of the National Hydroelectric Power Corporation (NHPC), said the Minister of Power had taken several steps to accelerate hydro power development by higher budgetary allocation for the hydel sector, giving priority to languishing state sector projects and levelled a 5 per cent development surcharge to supplement resources for hydro-electric projects by the NHPC. The CMD said the ministry was further concentrating on basin-wise development of hydropower, getting ranking study done by the Central Electricity Authority (CEA) for the hydro sites with an aim to prioritise balance hydropower projects and optionally utilise them over a next few decades. For Central sector projects, a three-stage clearance procedure has been introduced with an objective of reducing the time and cost overturn, he added. He said the power-demand projections made in the 16th Electric Power Survey would require a need-based capacity addition of 55,000 MW and 52,000 MW of power during the forthcoming 10th and 11th plans respectively, adding that the hydropower development would need further boost in order to bridge the gap between demand and supply. Mr Prasad said the CEA had prepared a vision paper on the development of hydroelectric potential in India by 2025-26; which envisaged harnessing of entire balance hydropower potential of India by year 2025-26. He said during the 10th and 11th plans; the vision paper envisaged a hydro-capacity addition of 10,400 MW and 21,300 MW, respectively. He said that the likely requirement of funds for this capacity addition would be of the order of Rs 1,300 billion. Mr Prasad pointed out that hydropower was renewable, economic, non-polluting and eco-friendly source of energy having an inherent ability for instantaneous starting, stopping, load variation and reliable power system as compared to unsatisfactory system conditions prevailed especially in the Eastern and Western regions having predominance of thermal power. To cope with this situation, the CMD said that the ideal hydrothermal mix should be in the ratio of 40:60, but at the present hydro share was below 25 per cent, which would become about 27 if 31,700 MW of hydropower were added by 2012. For this, the Central Government was determined to ensure maximisation of hydro-development and extend full support toward this end, he said. Mr Justice Wungazan Awangshi Shishak was sworn the Chief Justice of the Himachal Pradesh High Court here today by Himachal Governor Dr Suraj Bhan. The Chief Minister, Mr P.K. Dhumal, Leader of the Opposition, Virbhadra Singh, judges of the high court, Chief Secretary, Harsh Gupta and senior functionaries were present on the occasion. Mr Justice Shishak was Chief Justice of the Chhattisgarh High Court before coming here. Born in 1941, he did graduation from the Gauwahati University and passed LL.B from the Delhi University in 1965. He was sworn a judge of the Gauwahati High Court in 1989 and elevated as Chief Justice of the Chhattisgarh High Court in December 2000. The Himachal Pradesh Housing Board has in principle decided to convert the leasehold residential properties in New Shimla and Kasumpti into freehold. The decision was taken at the meeting of the board held here today under the chairmanship of Mr Roop Das Kashyap, Urban Development Minister. The modalities to implement the decision would be worked out by a high-level committee. The board also agreed to go ahead with the acquisition of land at Mehali in Shimla and Daruhi and Radiyal in Hamirpur for establishing housing colonies. Mr Kashyap informed that the recent sale melas conducted by the board at Baddi, Parwanoo, Nahan, Paonta Sahib, Hamirpur, Dehra, Nurpur and Una were a big success. The board had been able to dispose of 80 houses and flats at an approximate cost of Rs 4.75 crore. It was decided that the next sale mela would be held after June, 2002. The state has failed to make satisfactory progress on the agriculture front. In the past three decades an annual increase of 2.5 per cent in the production of crops has been witnessed as against a similar annual rate of growth in population. The decrease in the area under crops like millet, rice, pulses and barley between 1971-72 and 1995-96 depicts a pathetic picture of the agriculture sector in the state. The only consolable fact is the increase in the area under wheat and maize during this period. This was stated by Mr Kuldeep Singh, general secretary of the Himachal Pradesh Kisan Sabha and member of the CPM state committee, who recently completed a study on agriculture and horticulture in the state, while talking to this correspondent yesterday . He said base on the three-year moving average the area under wheat rose by 53,100 hectares, under maize by 49,460 hectares. While under rice it fell by 13,100 hectares, under barley by 14,400 hectares, under millet by 19,200 hectares and under pulses by 35,600 hectares. To review the progress of 126 mw larji Hydel Project, Mandi, a project monitoring committee meeting with engineers involved in the construction was held here yesterday. It was presided over by the Financial Commissioner and Secretary (Power) and Chairman, HPSEB, Kanwar Shamsher Singh. He directed the engineers to accelerate the construction work. It was decided at the meeting that all construction work related to the project would be divided into critical and non-critical activities. The Himachal government was committed to the all-round development of the state and this district was not an exception. Mr Maheshwar Singh, member of Parliament, said this at a function at Bhuntar 10 km from here yesterday. Mr Maheshwar Singh was given a reception by the Bodh Sangh of the district. The MP announced Rs 1 lakh for the additional construction works of the Bodh Sangh community hall. He also assured that Upper Sharabai and the Parganu area would be linked with road. Water problem of the area would also be solved. Mr Maheshwar Singh said drinking water for all and road link to every village under the Pradhan Mantri Gram Sadak Yojna were priorities of the BJP government. Two schoolchildren were drowned when they fell into pond near Daroh village, last evening. According to reports, the tragedy occurred when two brothers, Anuj (5) and Abishek (8) were coming back home from a local school. They stopped at the pond to have water. All of a sudden Anuj slipped into the pond. Abishek was also drowned while trying to save Anuj. Later, some villagers took out the bodies of both brothers.